All Dyno Places Booked Maximum 20 Cars. Observer places will remian open to the 14th July. 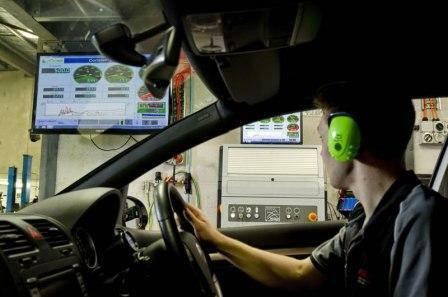 This will include an exhaust gas analysis which in combination with the dyno results will provide a good indication of the health of your Porsche engine. A $15 registration fee is being charged for those members who just want to come and learn more about their cars and just ask Bob and his team specific questions about their cars. Bob has generously offered to dyno members cars on the day at a greatly reduced rate of $50 for 2 wheel drive vehicles and $75 for 4 wheel drive vehicles [due to longer set-up time]. In addition, Bob has generously pledged that all money raised on the day is to be donated to the PCNSW nominated charity. There is space for 40 or so attendees on the day, however, there will only be enough time to dyno 20 cars. So register early as dyno places are on a 'first in - best dressed basis'. This day will be particularly useful to those members registered in the PCNSW Competiton series so they can learn the true power of their Porsches to determine the correct power/weight class they should be competing in.